Welcome to the Parallax Discussion Forums, sign-up to participate. Wow, I've missed a lot of figure 8 posts. I've just skimmed the last couple pages but I'll need to go back and watch all the videos. Here's a much over due addition from myself. I'll be shipping this bot off to Canada soon but I have the parts to make one for myself. As mentioned by erco, it's tough to program a figure 8 with timing alone. I used timing in the above attempts but I'm wondering if there's a way to tap into the ESC's six sensor wires to use the sensor wires as an odometer. I had hoped the ESC would automatically do this but it's obviously not. The above robot base will be turned into a mouse droid for a member to the Outer Rim Garrison. I didn't have a speaker attached to the robot but the robot will be able to play sounds off a SD card to make appropriate Mouse Droid noises. Nice, Brother Duane! Great to have you back in the figure 8 fold. Now you are being commissioned to build bots for Canadians, eh? "When you make a thing, a thing that is new, it is so complicated making it that it is bound to be ugly. But those that make it after you, they don’t have to worry about making it. And they can make it pretty, and so everybody can like it when others make it after you." The mouse droid is neat. We haven't had very many car steering entries. Duane: Get jiggy with it before you ship it away! I'll need to wait to try drifting until I have my own hardware put together. I knew I wanted to make this robot drive in a figure 8 but I was a bit concerned about taking the extra time to program the figure 8 feature (it's taken me much longer to program this robot than I had thought it would). It turns out the guy in Canada (his Outer Rim Garrison name is "DeathProof") liked the figure 8 and asked if there was a way to make the figure 8 continuous. This feature wasn't hard to add so now there's a parameter which, when set, will make any figure 8 run continuously. A press of one of the Nunchuck buttons will stop the figure 8. Parameters can be changed using the Nunchuck. I look forward to putting my own robot together. Maybe then I'll give drifting a try. The motor on this thing is likely powerful enough. Great job Duane, man you take them hair"spin" turns pretty fast. Though I don't know what MCU your using. I'm guessing you're referring to erco's figure 8? I'll once again attempt to follow in erco's foot steps and attempt to make a drifting bot. 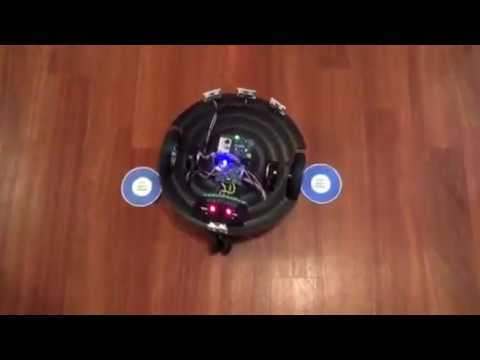 I used a Propeller Activity Board for the brain on my bot. I'm pretty sure erco used a PICAXE on his. 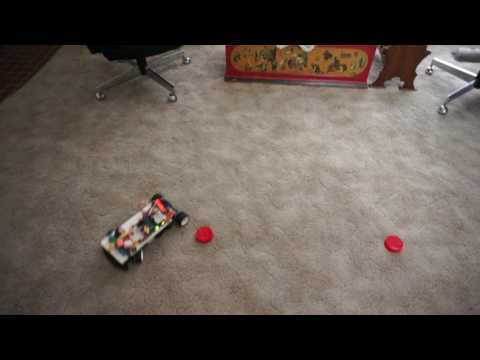 Here's a video erco made with more detail about his drifter bot. No, I was talking about your robot on the carpet, your speed seems to be, go no go. I think you are using a wii nunchuck, it has about the same resolution as the Sony type thumb controlled joystick. 0-9_RC-Time resolution. Maybe then I'll give drifting a try. The motor on this thing is likely powerful enough. My dirty old trick is slick tape around the rear wheels. your speed seems to be, go no go. 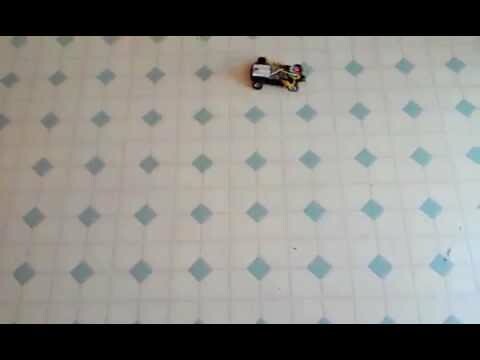 The ESC doesn't have very good low speed control. The motor won't move with pulse signals between 1500us and 1560us. The top speed in the figure 8 used a pulse length of 1575us. So in the figure 8, there's only 15us between stopped and the top speed used. The Nunchuck was only used to start the figure 8. I only manually controlled the bot to move it into its start position. The Nunchuck has a full 8-bits resolution (0 to 255) on both axes. There are six sensor wires which run between the brushless motor and the ESC. When I make time to make my own robot from this hardware, I'll see if the six sensor wires can be used for better speed control. I had hoped the ESC would have better low speed control since it has speed information from the motor. There are lots of options for pinion gears for this motor. I used the smallest pinion gear available but this wasn't enough to insure good slow speed control. There are lots of parameters which can be set by the user in an attempt to tame the robot. 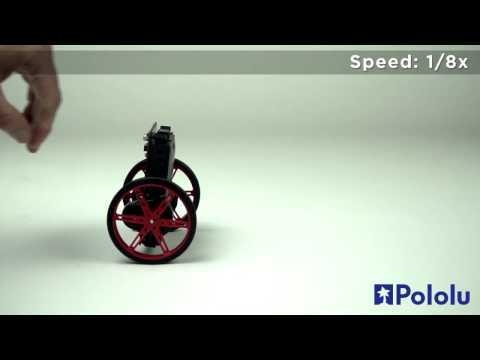 I have top speed and acceleration parameters available which should help make the robot easier to drive. The parameters are set using the Nunchuck with the value of each parameter displayed on the 7-segment display. Yes, I saw that. I'll likely try the same thing. New Pololu bot does a fig 8 pretty darn well and we didn't even ask 'em to. WHILE BALANCING AND PLAYING MUSIC. Seems kinda pricey at $70 WITHOUT motors or wheels though. Sell the complete kit, maybe with options. Love that circus tune, the BS2 makes nice music, shouldn't be to hard to do, if one had sheet music. I have use of a Casio keyboard with MIDI out/in, but that tune would be tough to do by ear. 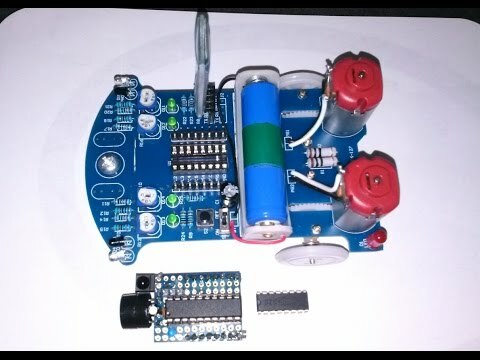 This sub-$3 balancebot kit includes wheels and motor. And possibly some free gerbilling. I'm clearly missing something here.. isn't that concept inherently self-balancing? It's cheap enough that I could easily add it to the hoard, but would it be better than just connecting two wheels with a wooden stick..? That's the gag. Yes it's inherently stable, the motor & battery just hang below the axle, not balancing at all. But the seller is free to say "self balancing smart car". Be vigilant! Plus, the " kit" is just slapped together with cable ties. No two alike! I'm not sure if you could even get a battery in or out of that battery holder with those cable ties in the way. Hacked $12 D2-6 robot from this thread. Our customers in China didn't know it, but they're now part of the Erco Figure 8 Challenge! Hey, Maybe we can call that type of wheel setup a "Programmable Caster Assembly"
I like it, thanks for sharing. Neat robot. The cardboard works better than I thought it would. I am LOVING IT! Fantastic! Nice, very nice. It looks like an easy conversion to a tri-copter! Three wheels assures all wheels stay on the ground. But I wonder how the cardboard holds up, if the wheels were trapped by obstacles, and working against themselves. A rover made of cardboard isn't practical for a final design, but it is a unique and capable design otherwise. Magnifico! Bravo! Nicely done! Best 8 in forever. Whit owns the Figure 8! Perfect and very smooth movement Whit! Erco invited me to join, and looking at this post I have noticed that you have been having a lot of fun with this challenge since at least 2012.